I’ve recently deployed the vRealize Orchestrator appliance (6.0.2) and noticed right away that my default browser Firefox, would not load the Orchestrator appliance web panel. Firefox always complained about a weak Diffie-Hellman key. “Server has a weak ephemeral Diffie-Hellman public key“. I now had a problem and contacted VMware support, below is the very easy fix to make vCO 6 work in both the latest version of Firefox and Chrome! Do the exact step above for the /etc/vco/configuration/server.xml file. Finally reboot the vCO appliance by typing “reboot”. 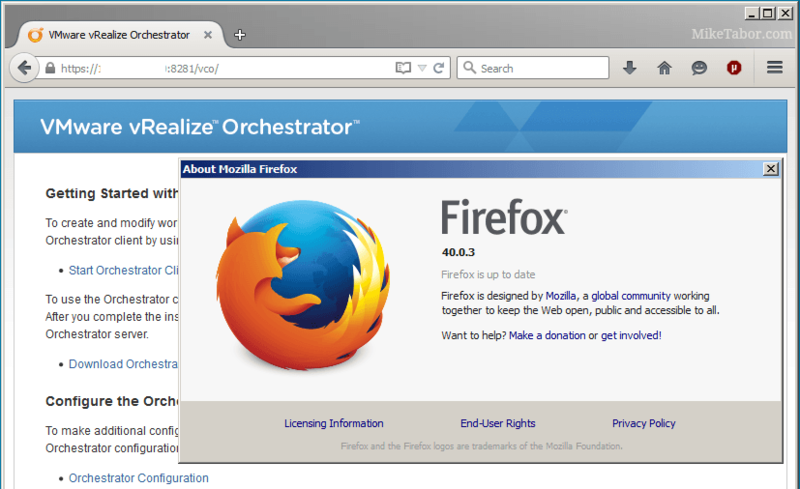 After the reboot vRealize Orchestrator should work just fine on both Firefox and Chrome now! In short, the vRO appliance is configured to use SSLv3 and some of the cipher suites (Diffie-Hellman) are now considered unsafe (POODLE vulnerability) and browsers have started blocking said ciphers. The above steps resolve the issue by removing the Diffie-Hellman cipher suites from the vCO appliance which in turn make Chrome and Firefox both happy.